Poses 64 poses, 6 horse poses. The links between the English and Norman ruling families went back long before the Battle of Hastings, and the English King Edward ('the Confessor'), himself the son of an English father and a Norman mother, had spent many years exiled to Normandy before gaining the throne. Over the course of his reign he favoured some Normans with appointments, despite this being unpopular, and he seems to have been unclear, or changed his mind, over who would succeed him. William, Duke of Normandy, felt, or at least claimed, that he had been promised the throne, though the facts are now obscure and were probably so at the time. In the event the childless Edward died in January 1066, leaving the succession unclear, and when Harold Godwinson was duly proclaimed the new king, William assembled an army and invaded, leading to the battle which is probably the most decisive and momentous in English history. As with all the Strelets big boxes, this one is a mixture of old and new figures. The old figures are made up of three sprues from M001 Normans, two sprues from M002 Norman Archers and a full copy of 085 Norman Knights. In addition there are extra copies of the horses from this last set to mount the new figures (see sprue image). The new figures are three sprues of foot soldiers plus one of mounted knights, as pictured above. 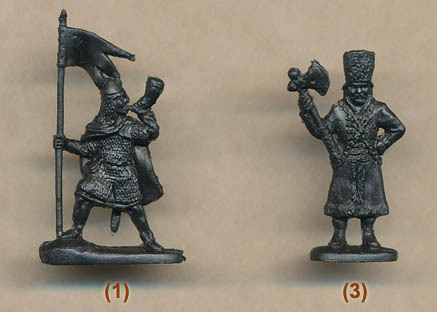 The new foot figures are pretty much just more of the same, with a mix of men dressed in various ways and carrying one of a number of weapons. There are two more archers, happily both unarmoured and both dressed in typical costume with arrows suspended from the waist belt along with a knife. One looks to be restringing his bow, which is an interesting pose you rarely see modelled, but both are good. The rest carry swords, spears, axes and maces, and again everything looks good. The hauberks are mainly mail, but there are also several that are quilted, which is fine. Helmet styles too are varied, but most have the characteristic nasal, and once more everything is authentic. We liked the new poses too, and the figure holding a banner and blowing a horn, though not a common piece on the battlefield, is certainly appropriate. The new mounted figures are again varied and mostly fine. All the weapons look good, and the poses are suitable too. There are several figures which caught our eye, starting with the man with the banner. The style of the banner seems OK for the period, but we could find no actual evidence for one this size. Banners were carried of course, especially the papal banner, which is illustrated on the Bayeux Tapestry, but there it is a much more modest size, though this may be a way to get it to fit on the cloth, and it needed to be seen in real life of course. Another figure of concern is the first in the third row of mounted men, holding his kite shield across his body. This would surely have been a tricky thing to achieve, and hard to see why anyone would want to, since the shield defended the open left side of the body. A poor choice in our view. Most wear mail or other armour, as you would expect, plus the usual helmet, but the third figure in the same row seems to wear a kettle hat, a style that only appeared in the following century, and even then only on infantry, so is out of place here. The inclusion of a man with no helmet (revealing a cleric’s tonsure) holding aloft a cross seems plausible, though thoughts of Bishop Odo are perhaps misplaced as there is no real evidence he actually took part in the fight, despite his many appearances on the 'tapestry' he paid for. Finally the figure lifting his helmet away from his face puts us very much in mind of Duke William himself, for he did this at one point to show his troops that the rumour he was injured was false. His rank is confirmed by the thing he is carrying, which should be a staff or 'baculum', but it seems the designer has misunderstood the representation on the tapestry and has produced a club in the shape on an animal. If anything it makes it look quite cute, but definitely not correct. The mounted men have been given extra copies of the old horse sprue to ride, and they fit well enough, though some equine poses are better than others. In fact the style of everything new matches well with the old sets, and the same plastic colour has been used, so the old and new blend effortlessly. There are a handful of separate weapons for the ring hands on some of the knights, which fit well, and one separate shield, which too is a very nice fit. There is no flash anywhere and no unsightly extra plastic, and detail generally is good and of the usual Strelets standard. The clothing and armour is accurate, with mostly knee-length hauberks and sleeves reaching the elbow, as was the fashion in 1066. A few have rather small-looking cloaks, which we would have preferred to lose, especially as it was unusual to wear a cloak in battle. Many of the new poses are nice and energetic, but a couple are a bit flat. 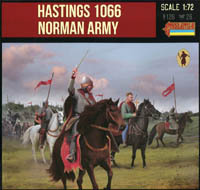 However overall we would have to say this is a good extension of the previous sets of Normans, and the extra figures like those with banners and the Duke himself will certainly be handy for any representation of the Battle of Hastings. Note The very final figure is related to the occasional series of bonus figures regarding the Streltsi of 17th century Russia. In this case however he is not actually a Strelets, but something much more exotic. See Streltsi Bonus Figures feature for details of this and all the bonus figures.